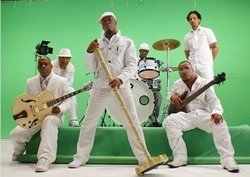 The popular Minnesota-based R&B group Mint Condition entrusted the creation of their latest music video to the faculty and staff of career college Globe University / Minnesota School of Business. The resulting video for the song "Nothing More to Say," from the album "eLife," debuted on BET January 1 and is rapidly gaining popularity across the nation. Minneapolis, MN (PRWEB) January 29, 2009 -- Students and faculty members of Globe University / Minnesota School of Business worked to create the latest video for Mint Condition, a successful R&B group based in the Twin Cities. The video debuted nationwide on BET on January 1st. Globe University / Minnesota School of Business faculty and students made up the entire crew of the video shoot except the makeup artist. Instructor Chris Hinding was the producer and instructors Christopher Whurr and Mark Kasper did post-production and visual effects. Instructor Wayne Johnson was the director and came up with the concept for the video, which he then fleshed out with the members of the band. See the video on YouTube. Students and graduates from the Globe University / Minnesota School of Business Music Business program and the Digital Video and Media Production program worked on the video. Music Business students worked as production assistants and helped with the playback of audio. Digital Video and Media Production students and graduates worked as camera operators, grips and performed other functions. Several students worked independently with Mark Casper to capture footage of Hennepin Avenue in Minneapolis for the video. Mint Condition's manager, Jeff Taube, is also an instructor at Globe University / Minnesota School of Business, and recommended the school for the video shoot. The entire video was shot at Globe University / Minnesota School of Business's studios in Edina.